Invictus is an easy to use, extremely versatile word press theme with a fully responsive design. 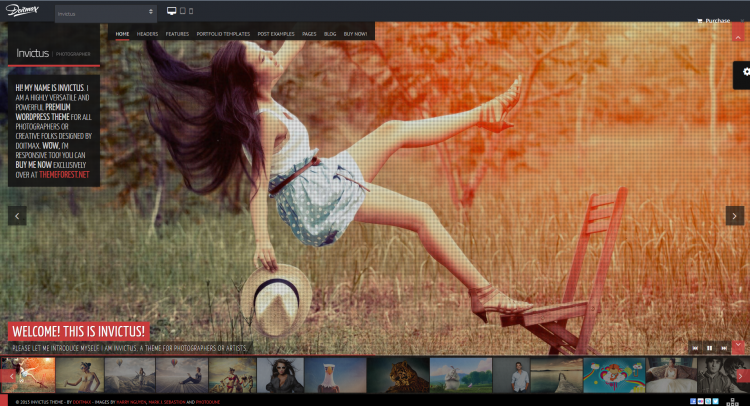 With flexible theme, page & post options Invictus is intuitive and very easy to operate out of the box. This theme is also equipped with the latest HTML5 & CSS3. Invictus was mainly built for photographers, creatives or video artists but can also be used for any type of portfolio.Invictus comes with a complete Google Font Library of over 600 fonts. Set the font family, font color, font size & more of each page element. Find out why Invictus is used by over 7,000 people! Miss Jack was born in Miami, FL and is the middle child of 5. She is a model and aspiring actress of Black American, causcasian and American Indian descent. From a young age she loved to put on shows for family and friends, and attended a Technical arts high school where she studied in Entertainment Technology. There Miss Jackson learned not only what it takes to be in front of the camera but all the effort that goes on behind the scenes including screen writing and film editing. She went on to study acting and psychology at Miami Dade, and the University of Miami, However, Miss Jackson’s passion does not only lie with modeling and acting. She also has a love for fashion design. Miss Jackson has been designing and has created a number of fashionable pieces since high school. Born in Los Angeles, raised in Venice and the So bay dytch began drawing at a very early age. By the 1980′s he was easily influenced by the scene around him. The west coast had become the epicenter of Skate Boarding, Break Dancing and Graffiti Art. graffiti became a way of life, and the artist known today as Dytch was born. Graffiti allowed him to share his art with the city he loved. Graffiti felt like it challenged him not only as an artist but as a person as well. It was the voice of the people; you could see expressions of all art forms in Graffiti. By the 1990’s Dytch wasn’t satisfied with his creations and decided to explore different mediums through works shops & art classes. He developed a better foundation of color theory and perspective. With his new found direction, he was able to fine-tune his skill. His talents have allowed him to work in TV, film, videos, commercial advertisements, and become a Muralist. People want to be inspired! Telling your story with moving images can awaken an emotion that will motivate someone to believe in your message and engage in your brand. With that belief, brothers Rick and Lynn Hensel founded Spot Media Production Group in 2003 as “Spot Creative Media”. After several years in the broadcast industry, Spot grew from a small side-project, with one camera and a laptop, to a full-scale operation in just a few short years. With a philosophy of establishing relationships we built a team of artisans excelling in video production, post-production, satellite uplinking and live streaming. Let us unleash our creative fury!